Create a map by clicking on the orange ‘Create a Map’ button on the ZeeMaps homepage. Give your new map a title, description and starting location in the information box that appears. If you are in a hurry, you can skip this configuration and just hit the ‘Create’ button. 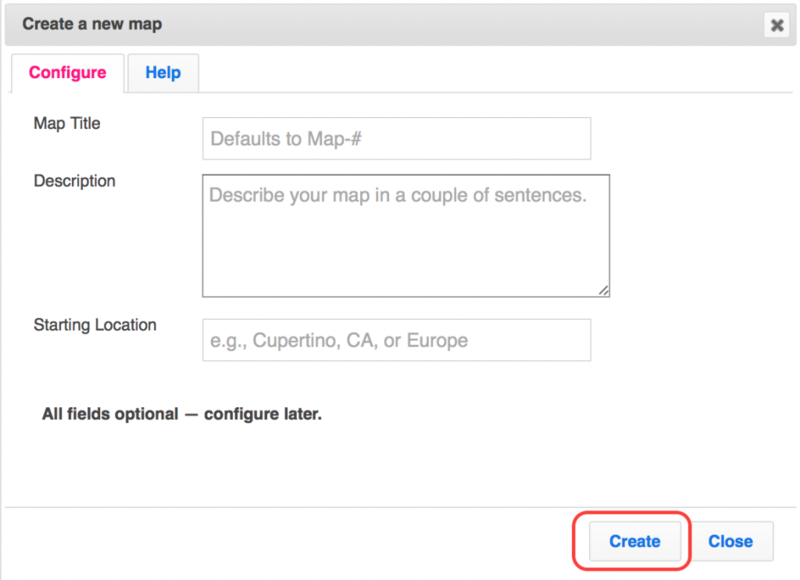 To create a new map from within an existing map, go to the menu item ‘Map’ then ‘Create New’. Can I change the name of my map? Yes, you can edit the map name at any time. From within your map, select the menu item ‘Map’ then ‘Settings’. Under the ‘Basic Information’ tab you can set or edit your map name. Another easy route is to click on the map name at the top of the page. A text box will appear and allow you to edit the name. Yes, you can display a description under the map name. To do this, select the menu item ‘Map’ then ‘Settings’. Under the ‘Basic Information’ tab you can type the description you’d like included. Due to space limitation, the description may be shortened in the map display. To see the full description, hover your mouse over the shortened description. You can get the URL link for your map by going to ‘Print or Share’ in the menu, and ‘Share Link/URL’ is the first item in the list. Select the top URL. As shown above, the top URL is for when you want to share a view-only map with others. 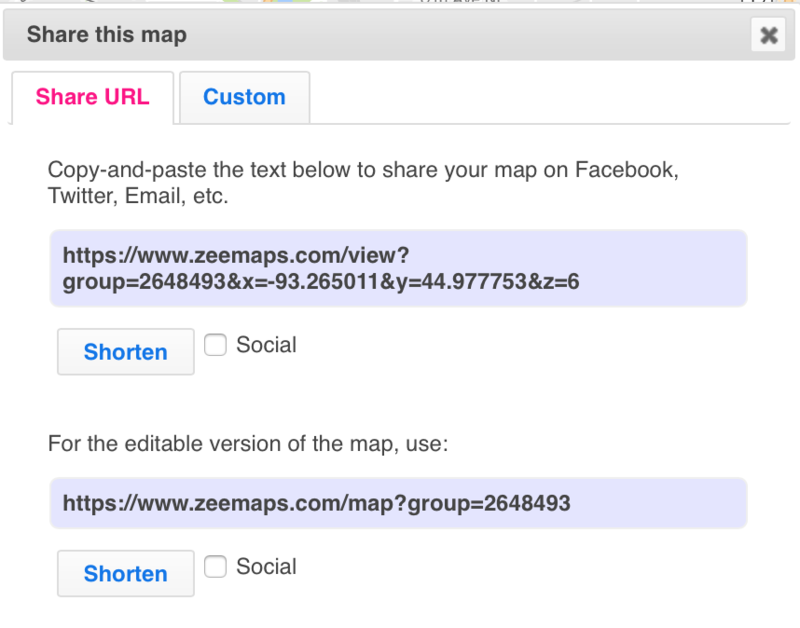 If you want to share a fully editable version of the map, select the second URL. How do I save my map? Maps you create with ZeeMaps are automatically saved to our servers. 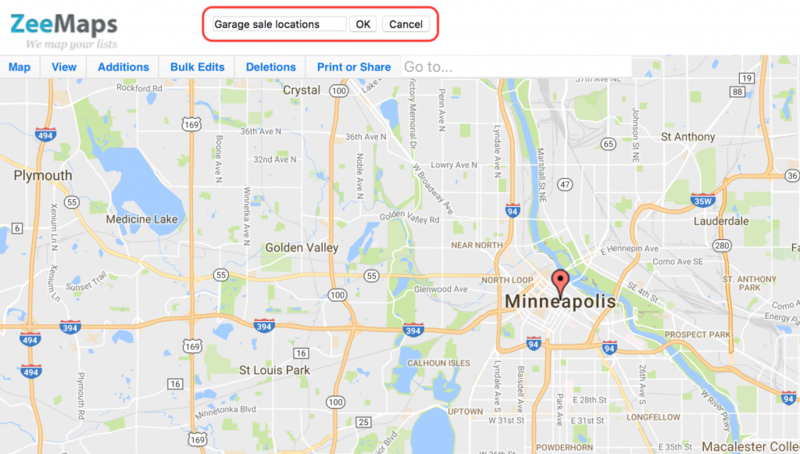 Go to your ‘My Maps’ page and select the maps that you want to delete by clicking on the map rows (not the map title). Then, click on the ‘Delete’ button. Since we limit the number of reusable maps in the Basic (free) plan, maps cannot be deleted while you are on the Basic plan.